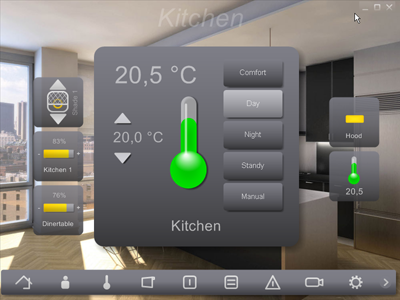 Home center is the software-interface for your home automation system. Ideal for control via touch screen, PC or mobile device. All home automation functions of your whole house are available at a centralized location. Or any other combination that suits your needs! Control of each component is done via a simple click or touch on the touch screen. The controlof other windows is also only one click away. Personalize it with a nice desktop and place all extremely handy buttons on it. Choose a nice picture, image, or use a floor-plan or picture of your living room and organize all functions of that room on it, why not?